To prepare the filling, mix together the meat, onion, potatoes and water. Season with salt and ground black and red pepper. To make the dough, combine the flour and salt in a bowl. Add a small amount of water at a time and knead until you have a hard dough. Divide the dough into 2 balls. Keep one ball covered while you roll out the other ball on a lightly floured surface to a thickness of about 2 mm (1/16 inch). 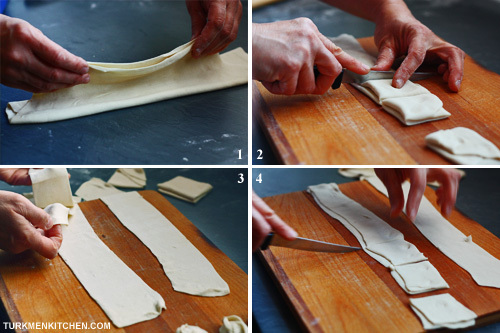 Fold the sheet in a zig-zag manner and slice the strip into squares. Unfold each square, stack the strips on top of one another and slice into squares again. 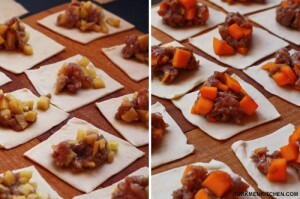 Spread the square sheets and place about a tablespoon of the filling in the center of each square. 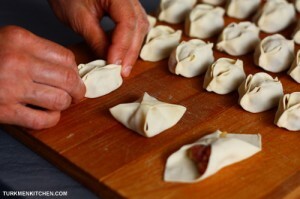 To seal the dumplings, take two opposite corners of the square and pinch them together in the middle. Repeat with the other two corners and then pinch the adjacent corners together. Fill the steamer pot with water and bring to a boil. 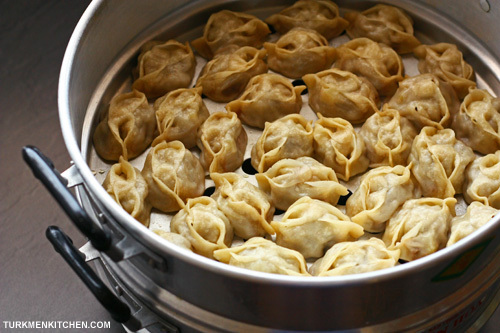 Grease the steamer tiers with butter and place the dumplings in the steamer with a bit of space between them. Stack the steamer tiers on top of the boiling pot, close the lid and steam for 25-30 minutes. Meanwhile, prepare the yogurt sauce. Grate a clove of garlic over a bowl of yogurt. Add the dried mint and ground red pepper and mix well. When the dumplings are ready, transfer them to a serving dish and serve with the yogurt sauce. *If you choose to have the potatoes in the filling, you can reduce the amount of meat. You can also use pumpkin instead of potatoes. Salam. Beren maglumatlaryňyz üçin köp-köp sagboluň! Birje soragym bardy: ýazan azyklaryňyz näçe kişilik adam üçin niýetlenenkä? Salam Aşyr, 5 adam töweregine bolýar. Thank you for the manty recipe! My cousin is from Turkmenistan and made this for us from her own recipe. I was glad to find this recipe. They are delicious! How many does your recipe make? Thanks Elizabeth. This recipe serves about 5 people.